Hyundai has stopped taking orders for its all-electric Ioniq in Canada, as they are facing a battery shortage. Green Car Reports got the heads up on the supply problem from a reader and its looks as if the order stop could widen. 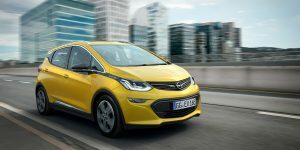 Sales of electric and plug-in hybrid cars have been on the up in the Netherlands this January. Compared to the same month last year, PEV sales grew by 126 percent overall, with sales of all-electric cars undergoing a massive recovery. 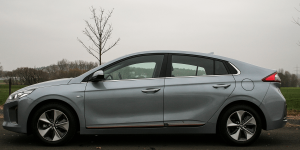 Video tip: After finishing a rather extensive test drive, Bjørn Nyland published a video showing the fast-charging capabilities of the Hyundai Ioniq Electric. 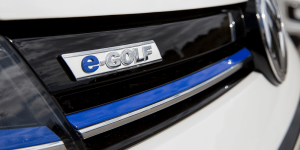 The EV’s 28 kWh battery can thus support charging capacities of up to 70 kW using CCS. Future of mobility, Hyundai Ioniq. Reading tip: The consulting group KPMG asked 1,000 mangers from carmakers, suppliers and other companies related to the automotive sector about the future of mobility. 62 percent believe that electric mobility will fail, because of a lack of infrastructure, while 78 percent see fuel cell technology succeed. Only a little more than half (53%) believe, the diesel has no future. 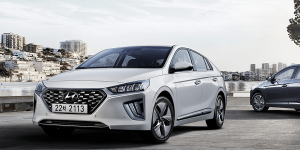 Video tip: Tesla driver Bjørn Nyland switched wheels for a “short” test drive, taking the Hyundai Ioniq Electric for a spin around cold Norway. In his two-part video review (80 minutes in total), Nyland says the EV is almost as good as a Tesla and he was impressed with the low energy consumption – despite the freezing cold. Donald Trump, Hyundai Ioniq Electric. Video tip: Hyundai goes the distance, releasing a video of a driving range test of its Ioniq Electric. The EV made it 218 miles (351 km) on one charge. Only downside: he did so driving at an average speed of 50 kph. Reading tip: Forbes analyst Stephanie Brinley took a close look at the 1,217-page draft report on fuel economy in the U.S., saying that while the target of 54.5 mpg remains, due to consumer preferences for trucks and SUVs, the industry as a whole may not reach a corporate average fuel economy. Video tip: Videos of first external test drives of the Hyundai Ioniq electric have been posted online. The comments are in Korean, but it seems that overall the new EV convinced. Public sentiment, Prius vs. Ioniq. Study tip: U.S. National Renewable Energy Laboratory has released a report on public sentiment on PEVs. The study covers purchasing behaviours, electric vehicle awareness, acceptance and barriers. Researchers found that i.e. respondents aware of charging stations were more likely to view EVs positively. Click tip: Hybrid Cars does a direct comparison between the Toyota Prius and Hyundai Ioniq. It’s a close competition, and powertrains, range, price and even tax exemptions will have to be weighed in order to find a winner. Click tip: Probably the world’s hybrid will be auctioned off the day after tomorrow. The 1896 Armstrong Phaeton features a combustion engine and dynamo flywheel that also uses regenerative braking to charge the on-board battery. 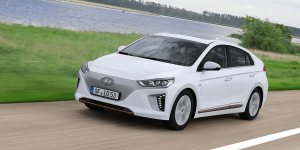 Video tip: Hyundai is showing its Ioniq with three different drivetrains in Geneva – all-electric, plug-in hybrid, and hybrid. Autogefühl presents all three models from the in- and outside, explaining the differences. Hyundai Ioniq, e-bike market report. Video tip: Hyundai promotes its upcoming Ioniq. The spot gives an impression of the vehicles design and cockpit.It is the company’s first dedicated hybrid and is expected to go head to head with the Toyota Prius. Research tip: The updated Greenfinder e-bike market report and mod21 now includes trends beyond the German borders and in all of Europe. A free preview is available online.